Got pesto? Got zucchini and onions? Try them all together on a pizza and be ready to fall in love! My family and I love our homemade pizza nights. Even though pizza is available--fast and inexpensive--from a variety of pizza places within just a mile of us, those ready-made pizzas don't hold a candle to our creations. Each family member gets to come up with their own ideas (admittedly, the youngest rarely strays from his regular cheese pizza). 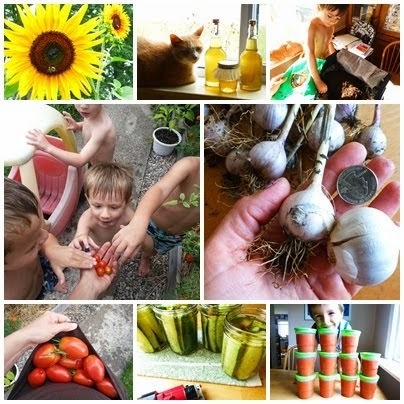 During the summer I love to come up with ways to use fresh veggies from the garden. The first time I tried fresh zucchini on pizza, I was astounded--it's delicious! I found this recipe in Lady's Home Journal several years ago, and adapted it to my own taste (namely, using Greek yogurt instead of ricotta, since I always have yogurt on hand. Click here to see how I make Greek yogurt--it's easy and tastes infinitely better than any commercial brand). The caramelized onions are really what make the pizza over-the-top delicious (fellow onion lovers, you know how awesome caramelized onion is on anything), and the zucchini takes a sort of co-star role. Together, and added to the pesto base, this simple pizza has become one of my all-time favorites. Maybe the kids won't try it (my oldest son loves it, but the other two still hesitate when unusual pizzas are presented). For us grown-ups, however, this is an incredibly tasty pizza to add to the repertoire of homemade pizza flavors! Got Pinterest? PIN this recipe HERE! 1. Preheat oven to 450 degrees. Heat the oil in a large skillet over medium-low heat. Add onions and cook, stirring occasionally, until caramelized. This can take anywhere from 30 minutes to an hour; usually I end up with onions that still have some glistening white, along with plenty of tan and crisp edges. Turn up heat slightly if it seems to be taking too long. *Note: onions can be caramelized ahead of time and stored in the fridge if you know you'll be trying this recipe and want to save some time on the night you make it. 2. In a bowl, mix the yogurt or ricotta (or a mix of both ingredients), pesto, and Parmesan. 3. Stretch and shape your pizza dough to the thickness you like (I love to make mine as thin as possible). In a pinch, you could use a ready-made crust like Boboli. Spread the pesto/yogurt mixture over the dough, and then place the zucchini slices on top. Spread the caramelized onions evenly over the top of everything, then bake in your preheated oven for 10-12 minutes. Enjoy! It will be hard to share! I love baking and homemade pizza is one food item that I end up baking often, the recipe for the pizza sounds delicious and I can’t wait to give it a try. love baking and this food items like pizza etc.